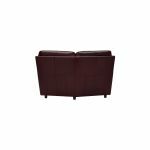 Create a corner sofa that suits your layout, lifestyle, and individual taste with the Modena corner module in Burgundy leather. Pair it with your choice of armless, right hand, and left hand modules to piece together your dream design. Real leather upholstery, pocket-sprung seats, and generously padded cushions provide luxurious softness that you won’t be able to resist! With a classic shape and subtle stitching across the front, a Modena sofa has a timeless appeal and is sure to suit modern and traditional homes. The high quality construction, with pinned and glued joints as well as real hardwood used in the frame, ensures it will hold its strong foundation over the years. 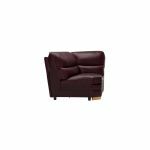 Check out the rest of the Modena range and start building your dream corner sofa!